LSUHSC is a member of the Deepwater Horizon Research Consortium, a network of community and university partnerships that will conduct research on the gulf coast over the next 5 years. Specifically, the LSUHSC School of Public Health is conducting the Women and their ChildrenÔÇÖs Health (WATCH) study, which will investigate the short and long term physical, mental and community health effects resulting from the Deepwater Horizon oil spill. Additionally, LSU Baton Rouge is involved in measuring the economic and ecological impact of the spill. Yesterday, the National Institutes of Health announced a new study which will follow tens of thousands of cleanup workers and volunteers who participated in the Deepwater Horizon oil spill. Since the safety of Louisiana seafood has been a big topic in the news lately, I was pleased to discover that the Louisiana Department of Health & Hospitals, along with the departments of Wildlife and Fisheries, Environmental Quality, and Agriculture and Forestry have been issuing weekly Seafood Safety Surveillance Reports since July. The latest report was issued today. A recent USMMWR article ranked commercial fishing as one of the most dangerous occupation in the United States, even without oil spills and dispersants. This won’t come as a surprise to fans of the Deadliest Catch. ** Solely the opinion of the author. LSUHSC-NO in no way supports, condones or authorizes the purchase of above product. unhappy anniversary ya’ll. See you in 154 days. It’s day 77 of the Deepwater Horizon disaster. Let’s celebrate with 77 public health links about oil and health. 65. 2-butoxyethanol from the Hazardous Substances Databank: human health effects, emergency medical treatment, animal toxicity studies, environmental exposure, pharmacology, chemical properties, occupational exposure, etc. Continue to #69-77, because our blogging software leaves much to be desired. I just received the following news release. The meetings are this week! 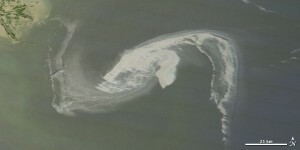 Scientists and government agencies are struggling to predict the potential health consequences of the oil spill in the Gulf of Mexico for those living and working near the region. At the request of the U.S. Department of Health and Human Services, the Institute of Medicine will host a public meeting to discuss the possible human health effects — both short- and long-term — resulting from the spill. Experts from the scientific community and academia, as well as additional stakeholders, will review lessons learned from similar disasters, identify groups most at risk for health problems as a result of the spill, and discuss how to prevent and monitor potential health consequences. 8:30 a.m. to 4:30 p.m. CDT on June 22, and 9 a.m. to 3:30 p.m. CDT on June 23, in the Queen Anne Ballroom of the Hotel Monteleone, 214 Royal St., New Orleans. Those who cannot attend may watch a video webcast of the event that will be available at www.national-academies.org. An agenda and registration information are available at www.iom.edu/oilspillhealth. WWL-TV featured a story on a couple of local surgeons, including LSUHSC’s own Kamran Khoobehi offering some ideas on how to stop the oil leak, using surgical techniques. Love the out of the box thinking! has created a new fact sheet on “Crude Oil Spills & Human Health.” The page is primarily an arranged group of links to other federal and state agencies. 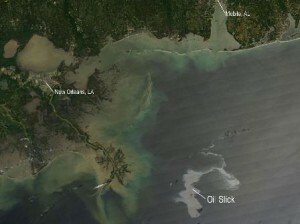 Nasa’s satellite imaging photographed the oil slick in the Gulf of Mexico caused by the drilling platform accident last week. It was featured in their Image of the Day Gallery on Monday.